Special thanks to my fellow writers, Bug and Hamilton and our awesome designer, Maahs. Additional thanks to Draft Express, The Ringer, Dunc’d On podcast (Nate Duncan and Danny Leroux) and Basketball Reference. Tons of great resources out there that were critical to us being able to put these scouting reports into existence. With all that said, let’s get into player’s 16-20 on the 2017 Dancing with Noah Big Board. 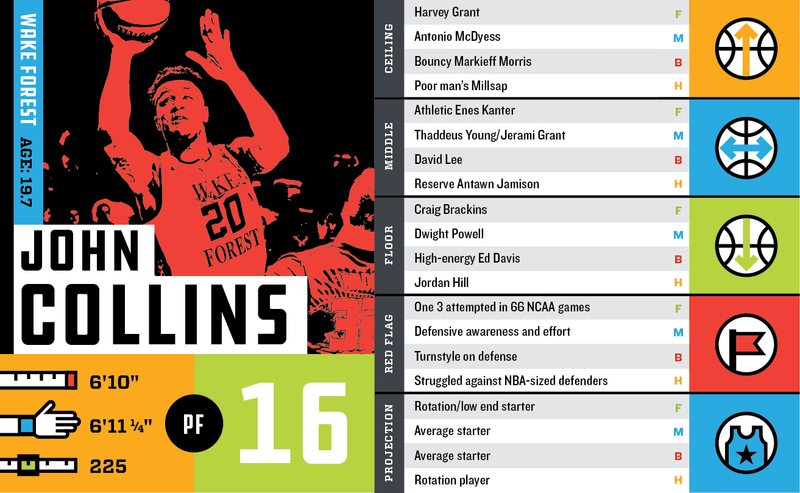 Hamilton: By some measures, John Collins looks like he belongs near the top of this draft class. He averaged nearly 29 points and 15 rebounds per-40 minutes and had the top PER in college basketball. He gets a lot of those buckets in the paint using an array of quick half hooks and little push shots that remind me of Antawn Jamison. He really uses lower body well to seal for position on post catches, rolls hard and is a good leaper off two feet when he has time to load up his jump. If Collins has any NBA skills that get him on the floor soon it will be his effort on offense, along with his rebounding. Collins’ catch-and-shoot game from 19-feet is solid for a college big. The form on his shot looks smooth enough to develop into a reliable jumper. His willingness to roll hard and fight for rebounds coupled with that shooting give him a chance to become a serviceable offensive player. He hits the glass hard on both ends, as evident in per-40-mpg rebound number. He seems to have a good second jump when battling in traffic for rebounds and tips a lot of balls to keep them alive. Tristan Thompson has made a ton of money with this as a key skill … That’s some of the good stuff. The not-so-good is mostly on the defensive end. Collins has just OK size for a five-man even in today’s NBA. He doesn’t have enough awareness to guard many fours, frequently getting caught helping uphill against dribblers. He gets lost too often even against basic movement. These things suggest a steep learning curve against pick-and-roll in the NBA. For how physical he is on the glass he doesn’t seem nearly as comfortable with contact while guarding. Oddly (to me at least) is how much better his footwork is offensively compared to his defensive footwork. And therein lies my concern for his career (at least early). He’s likely to be drafted late lottery or by a so-so playoff team. Those teams are more likely to have shorter leashes with guys who get killed on defense (looking at you James Young) than teams picking in the top-5-10. There’s definitely a path to a long productive career for Collins, but we may see very little of him over the next two-to-three years. Bug: This isn’t Justin Jackson’s first rodeo with the draft process. 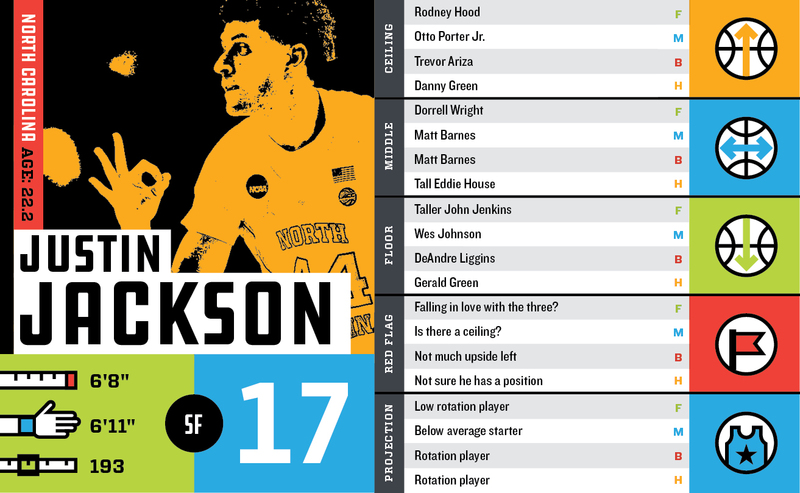 After his sophomore season, Jackson threw his name in the hat for the 2016 draft without hiring an agent. However, he was not met with the love from the scouts that he was hoping for last year. Jackson saw the writing on the wall, and pulled his name out to head back to school to put in some more work on his game. Fast forward to 2017: coming off a national title run with North Carolina, Jackson is now getting the positive feedback he was looking for last year. It’s a great success story for him, but there both positives and negatives to his initial failed draft experience. The obvious pros for the UNC product returning to school are that he played his way into a potential lottery slot, won a national championship, and fixed some of the weaknesses in his game (outside shooting jumped from 29% to 37%). That improvement also shows scouts that he is willing to put in the work necessary to succeed at the highest level of basketball in the world. The downside to coming back for another year is that he is now one of the oldest prospects in the draft and loses a lot of his upside appeal. How much more room does he have before he hits his ceiling? Based on his size and skill set (6’8” with a 6’11” wingspan), I think he projects as a solid “3 and D” guy in the NBA. Guys like Matt Barnes and Jared Dudley come to mind as comparisons, and they have never had a problem finding a team or a spot in the rotation. As long as he keeps improving his jumper and shot selection, while also keeping the same intensity on defense that he brought his junior season at UNC, he should have no problem sticking in the NBA. Jackson may never become an all-star player, but he should have a long, productive career as a solid contributor and possible starter down the road. 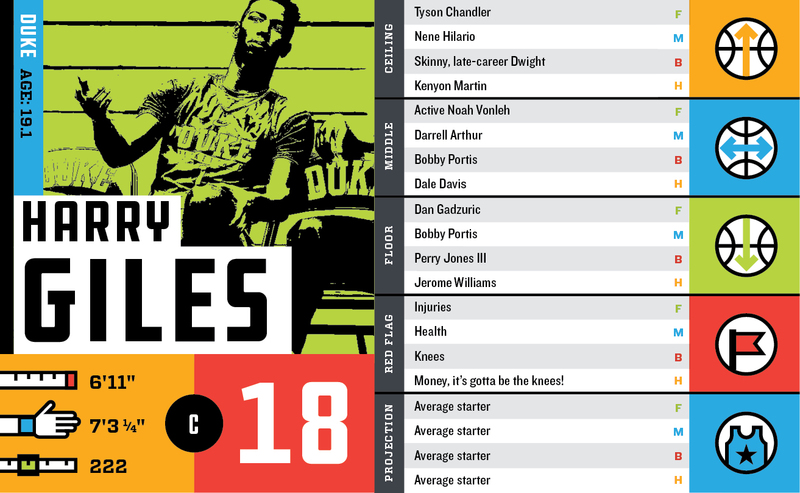 Fenrich: Harry Giles of Winston-Salem, North Carolina just turned 19 a couple months ago and yet his basketball career has already been beset by multiple semi-catastrophic knee injuries. In 2013, Giles tore the ACL, MCL, and meniscus in his left knee. In 2015, he tore his right ACL. Oy! Recovery for the second ACL bled over to his freshman season at Duke where he averaged under four-points-per-game and nearly eight-fouls-per-40 minutes. Reading and writing that made my head hurt. But what didn’t make my head hurt was watching Giles’s highlight tape. He has decent height (6’11”) and length (7’3” wingspan) that are bolstered by fluid athleticism. He runs the floor well without any obvious hitches from his knee injuries. The length and athleticism are further bolstered by what appears to be a solid motor. He understands team defense and doesn’t mind mixing it up on the boards or the defensive end. And where we often opt for the cool, unbiased certainty of stats and measures, seeing a guy give a crap and play hard still counts for something. He doesn’t seem quite ready to be a contributor on the offensive side. Like a lot of players his position and age, he seems like he’d be wise to watch tape of Rudy Gobert and DeAndre Jordan and learn the timing of how and when to roll on the pick-and-roll. Given that he appeared in just 300 minutes at Duke and has these two knee injuries, it’s challenging to see what he’s truly capable of. In those minutes, he took no threes and shot just 50% from the line on less than an attempt each game. It’s not that his offense is raw, but rather it might just longing for some TLC. I know that’s weird, but there’s a skillset here that’s better than the four-points-per game he showed at Duke. Maybe it’s just that he plays hard and doesn’t mind doing the dirty work, but I’m a fan of Giles. I have no idea if he can pass or handle the ball or stay out of foul trouble, but agile big men who can switch on the perimeter and don’t mind banging still have a place in the NBA and that means Giles has a home waiting for him in the best basketball league in the world. Fenrich: The mustache, the little fro, the headband. Jarrett Allen looks like someone straight out of the ABA and for a 19-year-old, he has a mustache that can make grown men envious – at least those longing for mustachioed excellence. 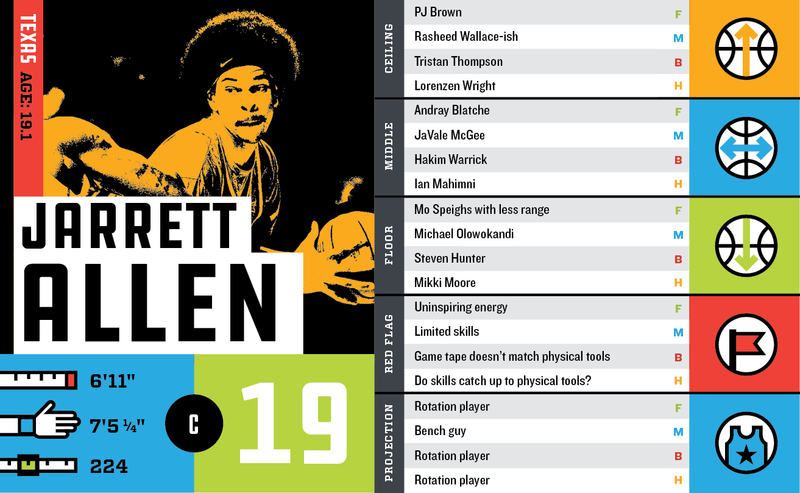 Allen is also longer and a better leaper than Giles (his age and positional peer). And yet, where I find myself excited and hopeful for Giles, I’m unenthused about Allen. With his length and hops, he can dunk without fear of reprisal. He’s capable of being a plus-rebounder and shot blocker because he’s just so damn long. There’s even a little mid-range set shot that makes me think of Marcus Camby and in his lone season at Texas, he flashed the ability to read double teams. But there’s a general aversion to mixing it up. In the tape I watched on Allen, he played with finesse (except when he was dunking in someone’s face) and seemed unwilling to bang with opponents. He doesn’t have to be compared to Giles, but where the Duke product went balls to the wall, Allen’s motor is a question mark to me. He’s listed at 235-pounds, but looks just as lean as Giles and without that wiry-type functional strength. It may be there, but he just hasn’t figured out how to leverage it with consistency. What I worry about with some prospects is that they’re able to get by on talent alone and when faced with equal or better competition, they don’t have the motor or desire to dial up their intensity to match the opponent. Is this the case with Allen or were my expectations just unfair due to his throwback look? Who knows? Is he Trey Lyles or PJ Brown? 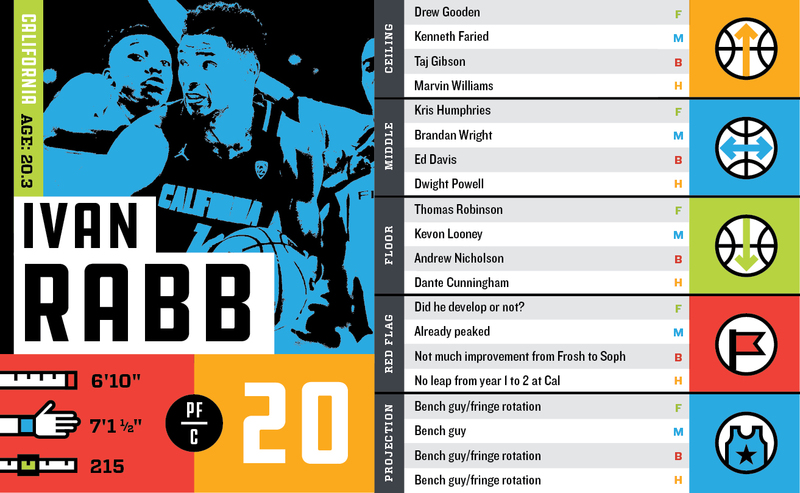 Fenrich: If we redid the big board, I think Rabb would likely fall further than anyone else. This kind of bums me out because I followed him over his two seasons at Cal liked what I saw of him around the basket. He’s a plus-rebounder with a good nose for the ball. Like seemingly every other big man in this draft, he’s got NBA height and length, but he’s somewhat limited in how he uses it. What jumped out to me as a red flag was the decline in his shooting from his freshman to sophomore season where his true shooting dropped from 63% to 54% despite shooting a decent 40% on 8-20 from deep. As his current skill set is constituted, he doesn’t project as having NBA-level scoring ability. Per The Ringer, he was a below average shooter from nearly every spot on the floor. He likes to play in the post, but at a not-too-strong 220-pounds, he doesn’t have the strength to bang and besides, he’s just not that efficient. Per Draft Express, he shot “a mediocre … 0.75 points per possession” in the post. He’s a kid who’s willing to work which is best exemplified by his effort on the glass. But the weaknesses are too many and the skill too low to project out as an NBA starter. In a best-case scenario, he’d develop some type of mid-range game-to-three point game, guard fours and fives and mix in some small ball lineups. Absent that, he’s a less athletic Ed Davis or Thomas Robinson.